A flamboyant, eclectic dinosaur covered in glitter, perhaps. Name is unrelated to shade...as usual. Dinosaur Plushie is filled with multi-colored sparkle, some of which can change hue in different light. Transparent sparkle over most primers, but over a sticky base, like our Pixie Epoxy, it is a gleaming pale metallic with many flashes of colors. 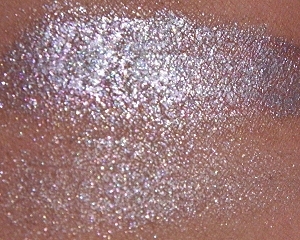 Swatch shown applied over diluted Pixie Epoxy, then over bare skin.